The Supreme Court on Friday extended the house arrest of five activists accused of Maoists links for four more weeks. The apex court refused to constitute SIT (Special Investigation Team) to probe the matter and asked the Pune police to go ahead with the investigation. 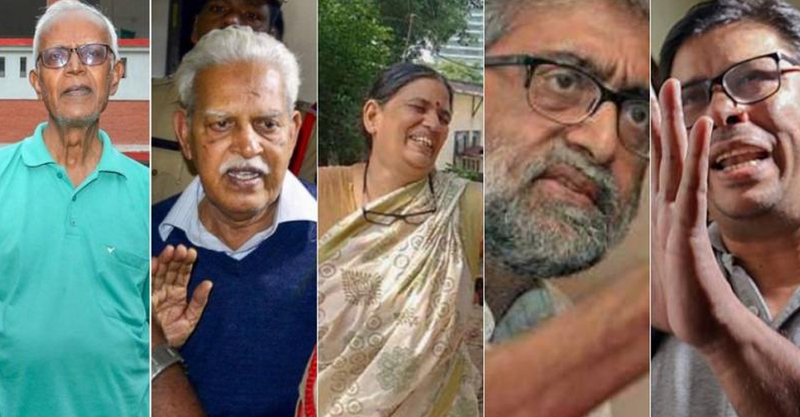 The top court also refused to interfere in the arrest of activists — Varavara Rao, Arun Ferreira, Vernon Gonsalves, Sudha Bharadwaj and Gautam Navlakha — in Bhima-Koregaon case. A bench headed by Chief Justice of India, Dipak Mishra and comprising Justices A M Khaniwlkar and D Y Chandrachud, on Friday gave a 2:1 judgement on the plea. Justice Khanwilkar added that the accused persons cannot choose which investigating agency should probe the case. Justice Chandrachud said he was unable to agree with view of CJI Misra and Justice Khanwilkar. Justice Chandrachud further said the petition was genuine and lashed out at Maharashtra police for press meet, distribution of letters to media. “Liberty cherished by Constitution would have no meaning if persecution of 5 activists is allowed without proper investigation,” Justice Chandrachud said, adding that the arrest of five activists was an attempt by state to “muzzle” dissent. The court said that the activists arrested in Bhima Koregaon case can move trial court for relief. The apex court was responding to the plea by historian Romila Thapar, economists Prabhat Patnaik and Devaki Jain, sociology professor Satish Deshpande and human rights lawyer Maja Daruwala, who had sought an independent probe into the arrests and the immediate release of the activists. The activists had been arrested by the Maharashtra police on August 28 in connection with an FIR lodged following a conclave ‘Elgaar Parishad’ held on December 31, 2017 that had later triggered violence at Koregaon-Bhima village in the state. The bench had earlier reserved the judgment on September 20 after counsel for both parties, including senior advocates Abhishek Manu Singhvi, Harish Salve and Additional Solicitor General Tushar Mehta, concluded their submissions. They had also asked the Maharashtra police to file their case diary pertaining to the ongoing investigation in the case. The five activists have been under arrest at their respective homes since August 29.